In a disruptive and accelerating world, we are all vulnerable to being hijacked. Just about anything can throw us off center – disruptions and distractions, wanting to escape and avoid reality, getting lost in our emotions or simply being blinded by misguided thoughts. Hijackers function a lot like Homer’s sirens. We are easily lured by them, and then end up being tossed on the rocks. They control us. And when we allow them to control us, we undermine our best selves and weaken our credibility and leadership. Hijackers come in many forms: worrying too much, wallowing in disappointment, or getting angry when things don’t go our way. In some instances, it’s certain kinds of people that hijack us – arrogant people, controlling people, selfish people. In some situations, we bring up old memories from the past and we get hijacked the same way we did before. Other times, it’s simply how we think that hijacks us – our obsession with winning, our tendency to be controlling, our perfectionistic style. The key is to be Conscious when you get hijacked, and to recognize the impact it has on your health and performance. Self-deprecation is a very effective tool of comedy but a tragedy for those of us prone to it. Many of us are vulnerable to blaming ourselves for the disruptions around us. Are you hard on yourself? Do you criticize yourself and everything you do? Do you always look for ways you were responsible for a problem? These are common attributes of self-critical people. People who are hijacked by self-criticality have trouble expressing their full power in the world and push people away by their poor self-esteem. In a world of mistrust and “alternative facts,” cynicism becomes a popular commodity. Doubting others and questioning their motives becomes the norm. Cynicism grinds you down and can sap your energy and joy. It is the primary indicator of burnout at work. Many of us try to hide our feelings or not let them interfere with our leadership and life. But hiding gets tougher every day. Wearing a mask is exhausting. We might be angry at our boss, frustrated with our staff, anxious about our family, or just cynical or burned out. If your level of engagement is not in top form, you can rest assured that the people around you will notice and feel it. As the world moves faster and gets more uncertain, the less control we have over it. Yet, in a strange way, the less control we have, the more we want to control it. The more we grasp, the less control we actually have. Beware that a heavy-handed desire to control can come at the expense of yourself and others. Whether by forcing your perspective upon others or micromanaging them, being too controlling is a surefire hijacker of relationships. If this hijacker were an animal, it would certainly be a cat – cautious and keeping her distance to protect herself. In this frenetic, crazy world we live in, it’s only natural to want to protect yourself. But people who are aloof create a feeling that they don’t care about others, causing both separation and alienation. They generate feelings of contempt, and this makes others feel inadequate. When you are aloof, you put distance between yourself and others. You could be perceived as reserved and detached, unapproachable and emotionally cold. Generally, this hijacker is driven by the fear of intimacy and human connection. It’s so easy to by lured by the spirit of competition. Healthy competition fuels our energy and accelerates performance. But when the need to win takes precedence over everything else, we can lose ourselves, our friends, and our opportunities. Some of us get seduced by a win/lose mentality and miss out on the potential for partnerships and alliances. Jealousy, envy, and lack of generosity take hold. Hypercompetitive people get lost on the island of self-interest and develop a reputation for being “out for themselves.” There is little evidence that being hypercompetitive makes for better success. 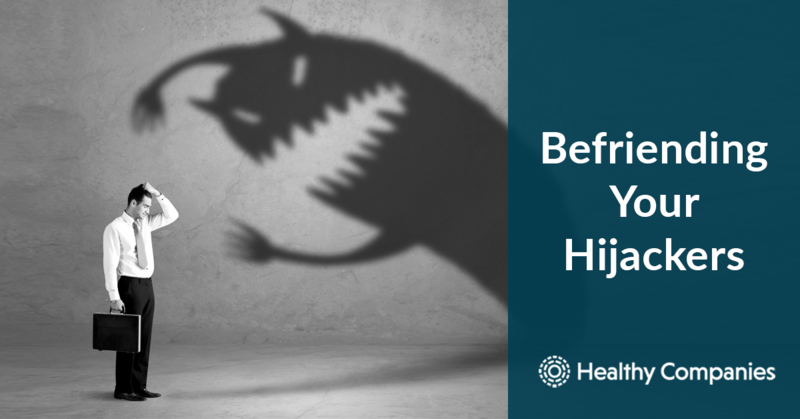 How can you befriend and manage your hijackers at work and in your life? Like a vicious cycle, our hijackers activate our brains. Stress chemicals like cortisol, adrenaline and norepinephrine are released and increase anxiety, sleeplessness, pain, and depression. Once we become more aware of what happens when hijackers are at work, we can choose a different response. The more Conscious you are, the easier it is to recognize and influence your hijackers and replace the behavior with one of your accelerators. The key for you is to be aware of how hijackers influence you, your teams, and your organizations. Hijackers and Accelerators are part of the Get Real practice in our book CONSCIOUS: The Power of Awareness in Business and Life. The other practices are Go Deep, Think Big, and Step Up. Is Success Your Drug of Choice? Can You See the Alligator in the Tree?